Machine Project presents a two week tabla (north Indian classical drums) interactive interstitial on various days from April 6 - 17, 2010 curated by Robin Sukhadia. 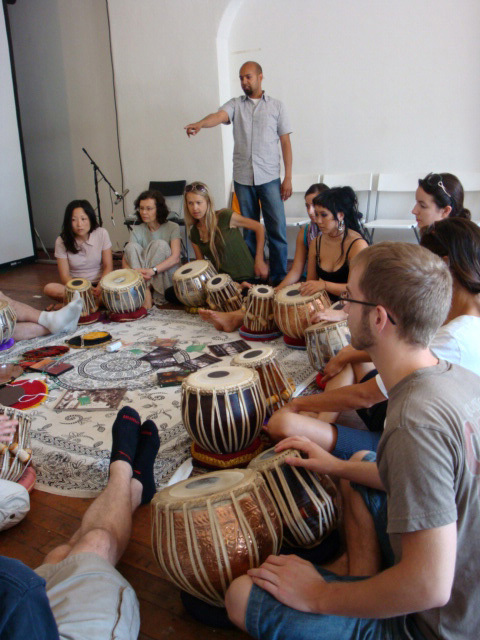 Visitors are invited to participate in a wide range of tabla-centered events including tabla workshops, film screenings and classical / contemporary Indian music performances. More information available at www.tablapusher.com. In Hammer Museum lobby - Open Beginning Tabla Workshop (2-3:30pm) plus special guests Randy Gloss @ 2:30pm, Christopher Votek @ 3:30pm (raga and cello demonstration) and Sheila Govindarajan @ 4pm. (FREE Museum Admission) In Hammer Museum lobby - Open Beginning Tabla Workshop (2-4pm) featuring special guest: Sheela Bringi (harmonium and Sanskrit chanting) plus Suman Laha performing on Veena + Jyoti Prakash on tabla @ 4pm. Visitors to the Permanent Collection and Luisa Lambri’s Being there will be presented with the option to “check out” guitarist Eric Klerks to walk with them through the exhibitions. He will follow the visitor around, playing live music into headphones through which only that visitor can hear. This event also happens intermittently on Saturdays throughout the year, in various galleries and exhibitions. Curated by Chris Kallmyer.